October is right around the corner. That means I’ve started pulling out my Halloween & Thanksgiving decor. I like to mix the two starting the last week of September (which is now) and then November 1st, I pluck all the Halloween out and am left with the Fall/Thanksgiving decor. This is my favorite time of year so I want to be able to enjoy my decorations as long as I can. As with most of you we are done with summer heat and ready for all the changes that are starting to take place around us. PINTEREST is my new bestie, we hang out A LOT, this is something my new friend has taught me.I guess you would call it Vintage/Victorian Halloween. I have started with this Burlap Wreath.There are a few different ways you can make them, but super easy and not very pricey.Punch burlap wreaths into the search box in Pinterest and several will pop up.After searching a little you can find which one works for you. 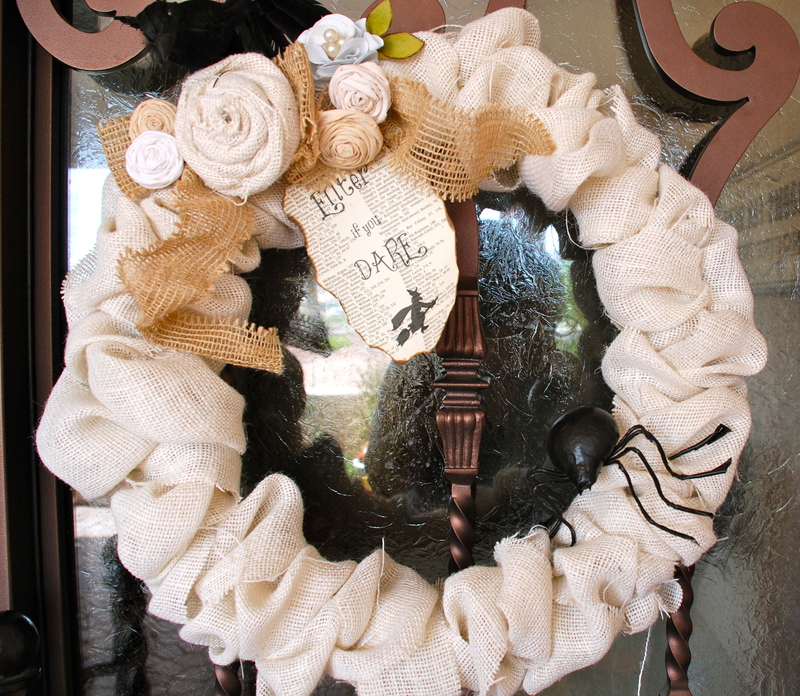 I then looked up “How to make a burlap wreath” into the internet and found a lot of DIY tutorials on how to make. I took ideas from different one’s and added some of my own. Don’t just stop with your first “How to Tutorial” because you will notice each tutorial is very different yet very similar so you need to find which one you connect with. The fabric rosette’s on the wreath I learned how to make on Pinterest and they are very easy to make. I took an old sheet and cut into strips, tea stained some of the strips for different shades. The one sheet made a lot of flowers(cheaper than purchasing material). I also found some scraps at the thrift store that only cost me change. So check what you have in your closet and then the local thrift shops and garage sales before you plop down more bucks at Hobby Lobby & Michael’s. Even though I want these store’s to be around forever we all need to save anyway we can. 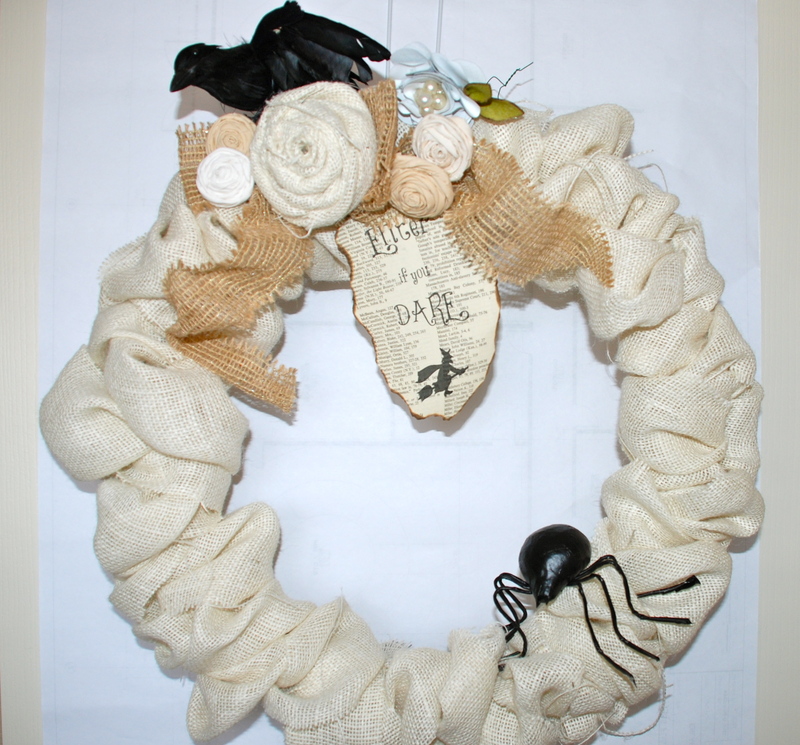 I printed the words “Enter if you Dare” onto an old book page, added a photo of the flying witch and hot glued onto the wreath. Added the little scare crow and spider and this is what I ended up with. 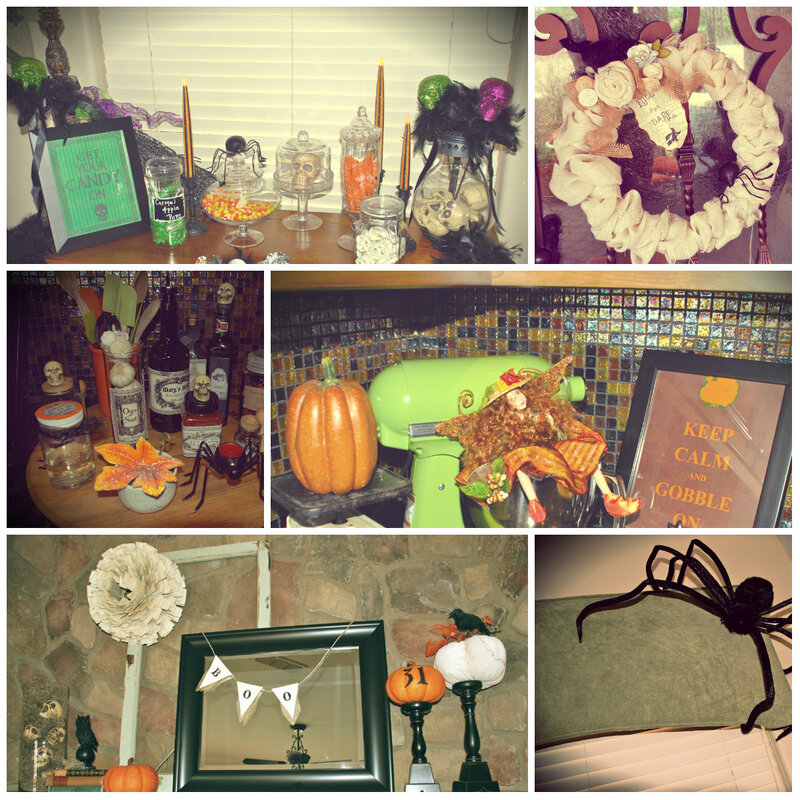 It was fun crafting and adding a different touch to my Halloween Decor. 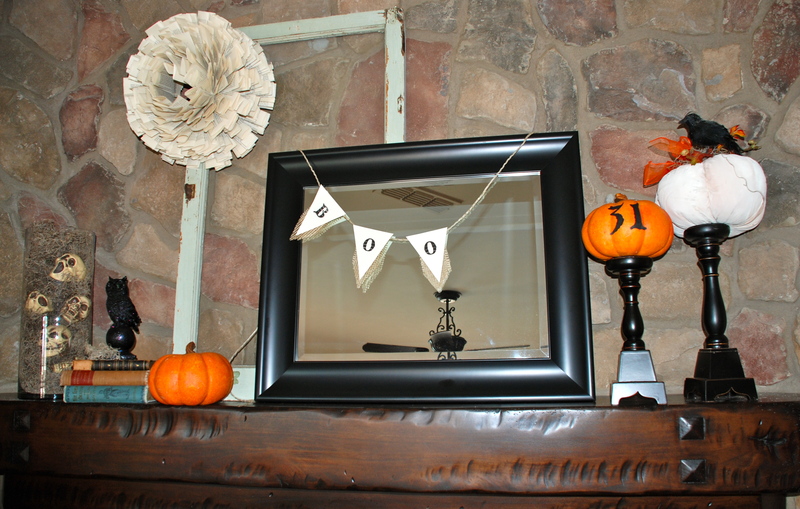 I also made the “Book page wreath” that hangs on my mantle(pictured below) I think it has the same feel of Vintage/Victorian Halloween.This style of decor is very popular this year so you can find a lot of ideas on the internet. Jones Design Company.com is where I learned to make the book page wreath. Check out her blog with DIY tutorials they are really cool. This is where I learned how to make the fabric rosettes. I got my Halloween/Fall decorating done early this year “yeah” so now I have all month to hang out with my new friend and see what else I can come up with. I think Pinterest has so many ideas for you that no matter what level of crafter you are you can find something that you can make and fill your home with the things you love.